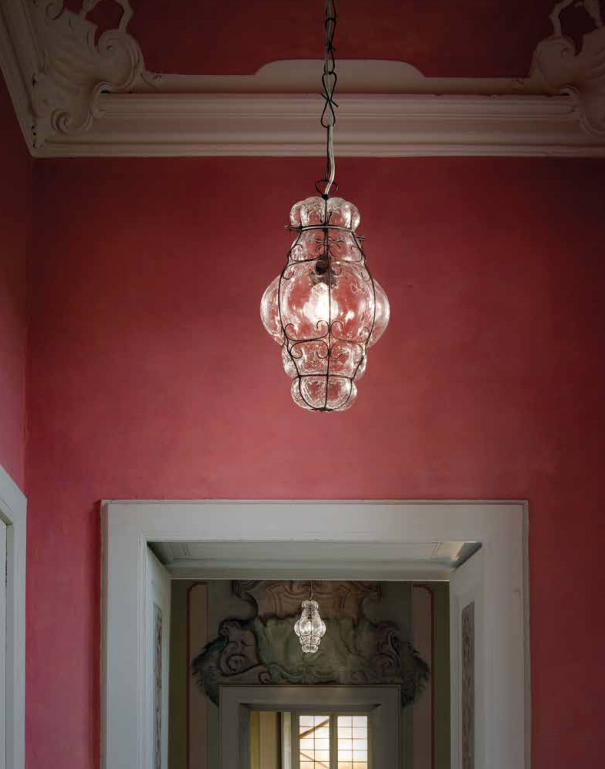 A sense of place, expert craftsmanship, hidden texture and luminous colour coalesce in these handblown artefacts of early 20th Century Venice. Reflections from rippling water spill unexpectedly over the walls, adding a suggestion of sea green when I flick the switch. Watching the delicate pattern shift over the ceiling, my thoughts turn to the light reflected from canals into grand entrances and doorways, the underside of bridges. Ripples play on walls and ceilings in Venice just as this light does now. Reflected light under a bridge in Venice and a Venitian light shining on a wall in Melbourne, Australia. Superficially, Seguso Murano caged glass pendant lights can appear old-fashioned. A throwback to grander traditions, before 20th Century design sobered up and embraced functionalism. They capture a particular moment of decorative glee that kicked up it’s heels one last time in the interwar period in Europe, when most production was still artisanal rather than mechanical. It would be easy to think they’re past their prime of decorative potential for the modern home. However, as great examples of skilled artisanal decorative art, their unashamed glamour can still bring something fresh to mid century decorating. They translate very well outside their original period because they are both beautiful and natural. When hung they appear as crystal clear, complex-patterned forms, suspended like rising bubbles in the deep sea. They exude a palpable sense of quality, of detailed handiwork and skilled manipulation. The scale is natural – they’ve been shaped by human breath. They are simply very satisfying objects. What do we know about these lights as artefacts? Technically, a blob of coloured glass canes has been manipulated at the end of a glassblowing rod into a cage, then expertly blown to fill it, to stretch and balloon out evenly on all sides. The glass has also been twisted left and right, forming a lattice of perfectly symetrical facets and ridges over it’s surface as it filled the wire cage. It’s clear that exceptional skill has been employed. What is not clear on first sight is that this was done with the express intention of producing the patterns of light I see falling here over my wall. The production of caged glass lanterns began in part due to the rising fortunes of decorative arts exhibitions such as the Milan Triennale in the interwar years. Another probable influence was the movement for traditional art known as the ‘Return to Order’, a revival of classicism throughout Europe in reaction to the mechanistic destruction wrought by the First World War. After the financial crisis of 1929 in New York, the glass-blowers of Murano endured the closure of several key glassworks. Master glass-blowers shifted their work to small studios and regrouped. In 1933, due to renewed commercial success, one such group founded the Artistica Soffiera e Vetreria – Barovier Seguso & Ferro (A.S.V. Barovier, Seguso e Ferro). The group included Luigi Ferro, Napoleone Barovier and Antonio Seguso along with Seguso’s sons Ernesto and Archemide. Art Daily notes that, ‘…the term Soffiera in the name refers to the parallel production of glass blown for lamps, a specialty of Napoleone Barovier’, indicating that lighting was being produced alongside fine decorative figurines and vases. Then in 1934 Flavio Poli joined the firm as artistic consultant. This brought a period of experimentation with coloured glass and new techniques, leading to international success. In 1937 the company made Poli a full partner and changed its name to Seguso Vetri D’Arte, which it remains to the present day. It is from Poli’s first period with Seguso, 1934-40, that the caged glass lamps emerge. Their success at this time stemed from their experiments with colour. One of the famous Seguso colours is ‘Laguna’ – originally produced as an opalescent glass. The colour is illustrated in a clear version below (and in our shop). It is a perfect match for the waters of the Laguna of Venice, displaying Seguso Vetri d’Arte’s ability to totally control colour technique. We can perhaps begin to see these lights as more than delightful expressions of Venitian glassblowing skill. 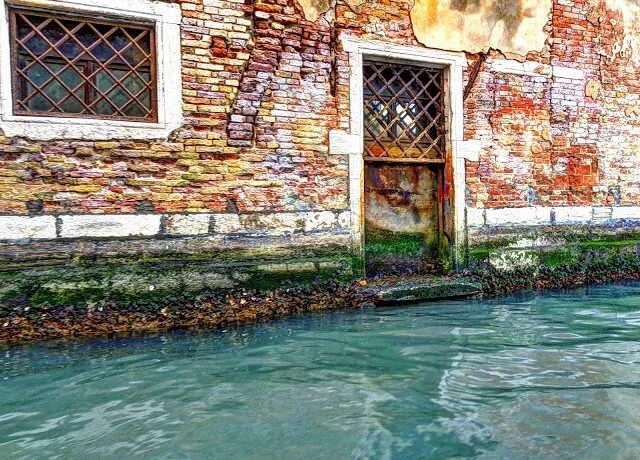 They are expressions of the very light and water, the refraction and reflection, the aesthetic pleasure of and physical encounter with the city of Venice itself. How to use a Murano Caged Glass pendant light. It’s sometimes hard to know whether a light will be the right choice when presented without context on a website or crowded by other lights in a shop. How will it look at home? Where should I put it? What’s going to set it off to the best advantage? How can I take advantage of the quality of light it provides? The answer with Murano Caged Glass pendants is to allow the light to serve practical and decorative purposes in equal measure. These lights sit best in small spaces where they can be enjoyed at close quarters. Hallways, entrances, conservatories are all good options. These are not designed to be bright lights and were never meant as a primary light source in permanently occupied rooms. They are designed for transitional spaces – they shed enough gentle, patterned light to be practical without making a small space feel stark and they will not dazzle someone entering from darkness outside. Like sun shining off water onto stone, they produce a gentle refracted light rather than a bright diffuse one. Venetian lamps in a wide hallway in Venice. The perfect setting for glass lanterns. Trio of Seguso Murano caged glass lanterns in our shop archive. The sculptor Henry Moore and his wife Irina hung a Seguso caged glass pendant light in a small entrance/vestibule at their family home, Hoglands at Perry Green, Hertfordshire UK. The home remains open to viewing for those interested in Moore’s sculpture or you can find it in this great book. A big plus is the beautifully simple mid-century interior, decorated in a consciously practical but very comfortable style. The simple quality of the décor is highlighted by touches of sumptuous form and colour, found objects and many small sculptural pieces. The Murano pendant light sits very well in this context, offering warmth and fullness to a restrained décor, highlighting the lantern’s gorgeous liquid colour. It’s bulbous form is reiterated in many of the sculptural items in the home. They can sit with Maximalism as well, carefully placed in dialogue with similarly punchy colours and rounded forms or with other lights in a trio or set as shown above. By placing them in a contained space such as a hallway, or hanging them close to a wall, you can display the full glory of the patterns they cast. This unexpected patterned light can be a sublime addition to a thoughtfully arranged scene within a room, or fill a small entranceway with charming and subtle texture.